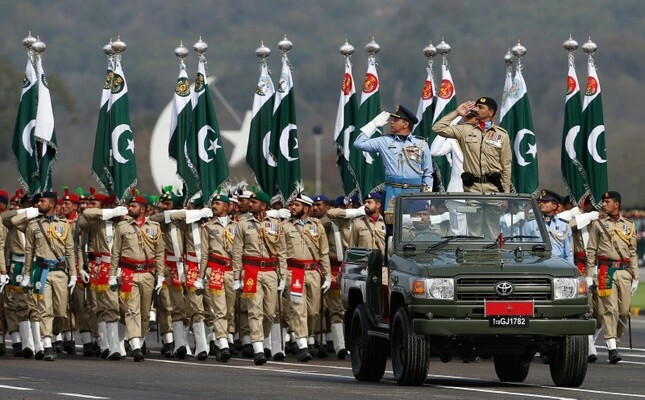 Pakistan marked its national day on Saturday with a military parade showcasing its missiles, tanks and aircraft, with a Turkish aerobatics team taking part in the celebrations and messages highlighting the solid relations between Ankara and Islamabad. President Recep Tayyip Erdoğan sent a congratulatory telegraph to his Pakistani counterpart Arif Alvi, saying that political, economic and cultural relations between the two countries, clinched further in bilateral high level visits, will be strengthened with the upcoming sixth High Level Strategic Cooperation Council Meeting to be held in Pakistan. "I fully believe that our bilateral relations, currently in an excellent state and established on the historical brotherhood of our peoples, will gain further impetus and develop in the upcoming periods based on the mutual interests of both countries," Erdoğan said. Pakistani Prime Minister Imran Khan visited Turkey earlier in January in a highly-publicized visit for both countries, which closely cooperate in a number of fields, including defense. Earlier in the day, Khan welcomed a message from Indian counterpart Narendra Modi weeks after a suicide bombing in the disputed region of Kashmir triggered an escalation in tensions between the two neighbors. "I welcome PM Modi's message to our people. As we celebrate Pakistan Day, I believe it is time to begin a comprehensive dialogue with India to address & resolve all issues, esp the central issue of Kashmir, & forge a new relationship based on peace & prosperity for all our people," Khan said on Twitter late Friday. Khan said the message from Modi extended "greetings" and "best wishes" to the people of Pakistan. The Indian premier sent the message days after the two countries revived diplomatic contact and discussed the opening of a corridor and a new border crossing to allow Sikhs to visit one of their holiest shrines in Pakistan. Addressing a military parade on Saturday, Alvi said that "Pakistan respects sovereignty of all countries and wishes peace." He said Pakistan's war is against hunger, poverty and unemployment. Alvi was to honor selected Pakistanis and foreigners with civilian awards later in the day. Naeem Rashid, who was killed while trying to stop the gunman who attacked two New Zealand mosques earlier this month, will be honored posthumously. Thousands gathered at the Islamabad Parade Ground to witness a stirring parade ceremony of the country's armed forces. The Solotürk pilot did a demo flight to demonstrate the deep fellowship between Turkey and Pakistan. "Congratulations to all Pakistanis on Pakistan Day," Serdar Doğan, the visiting Solotürk pilot, said when his jet arrived at the parade ground. The large crowd warmly welcomed the pilot and chanted slogans praising the friendship between Turkey and Pakistan when the Turkish jet took to the skies. President Alvi, Prime Minister Khan, visiting Malaysian Prime Minister Mohamad, and the Pakistan armed forces' services chiefs watched and praised the Turkish pilot's performance. "I really enjoyed today's event and I'm especially thankful to the Turkish nation, government, and their air forces who participated in our celebrations today," Zahid Shah, a young student from Peshawar, told Anadolu Agency. "Today I'm feeling proud of the Pakistani and Turkish air forces, and there is no doubt that both countries have the world's best pilots who can do anything," said Shazia Nasir, a resident of Islamabad. Turkish F-16 demo and stunt team Solotürk was founded in 2011 in honor of the Turkish Air Forces' 100th anniversary. At the Royal international Air Tattoo 2011 in Britain, Solotürk was awarded the King Hussein's Sword for the best overall flying demonstration among 29 air demonstrations and was also selected the best solo display team in Air Show Season in England in 2013. Besides Turkey, China and Saudi Arabia, the pride of Pakistan, the JF-17 Thunder, also performed in the airshow. In Ankara, Pakistani embassy marked its national day with a reception. After a flag-raising ceremony, Pakistan's national anthem was played and Pakistani students took stage to sing traditional songs in their native dress. Traditional cuisine from several different regions of Pakistan was served to guests at the reception. Speaking at the event, Pakistan's Ambassador to Ankara Muhammad Syrus Sajjad Qazi thanked Turkey "for always standing beside their Pakistani brothers in the most challenging of times." He said the fraternal bonds between the two countries "are perennial." Qazi said Pakistan's national day "serves as a reminder to nurture and uphold those ideals, principles, and goals that inspired the Muslims of the sub-continent to forge unity in their ranks and become one to realize their dreams." "On this day, 79 years ago, the Muslims of the sub-continent, through their collective will and indomitable spirit, expressed unshakable resolve to carve out a separate homeland for themselves where they could fashion their lives in accordance with their own traditions, values, and culture," Qazi said. Mentioning how Pakistan has recently gone through challenging times, he added, however: "There is indeed no force on earth that can undo Pakistan."